100 billion pounds of food waste are discarded every year, that is almost 25% of all our food. Additional waste is created at processing plants and farms. Rotting food creates methane, a terrible greenhouse gas. Someday trash dumps will recover all this gas. Right now, you can turn food scraps into useful matter by composting. Most local recycling programs do not support composting. Most are located in California. If your local sanitation department does not have a composting program, you can do it yourself. Composting is utilizing mother nature in turning food scraps and yard trimmings into super nutrient rich soil. It helps reduce waste and produces the best growing soil around. Backyard composting is good for gardeners and those who have lots of yard trimmings and some produce scraps. You know composting is going mainstream when you see Costco is selling several composters. Even Amazon has a bunch of low-cost composters. Here is a good guide to composting. We find it a great way to reduce the amount of trash put out and a great way to make some valuable rocket soil for growing plants. We put a container by the sink to collect compostables and later move them to our compost bin. 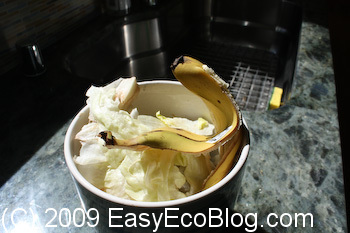 You can easily compost food scraps, vegetable and fruits. Also consider composting coffee grounds, tea bags (Synthetic Tea Bags do not compost), and the like. Some non compostable types of tea bags may be slick to the touch and have a heat-sealed edge. If this is the case, cut open the tea bag and trash it. Perhaps it is time to switch to a different tea. Our local trash company, Recology finally got with the program in 2011 and is now composting food scraps. Line the inside with newspaper or biodegradable bags. Do not use plastic bags. Sprinkle baking soda if it begins to smell. Flies can be prevented with essential oils such as citrus, eucalyptus, lavender, or lemongrass dripped on the inside lid. Here is our big compost bin. It works but is not built very well. The plastic parts come apart forcing us to relatch it every couple months. This compost is the final result of our efforts. Composting allows us to turn organic trash into super soil. Although composting requires a lot of effort and time, the benefits far outweigh additional trash in a landfill. CNBC’s Trash Inc: The Secret Life of Garbage helped remind us that garbage is everyone’s problem and needs us to be more responsible. New York City garbage gets hauled several states away to get dumped! It is good to see that even Coca Cola is getting green. 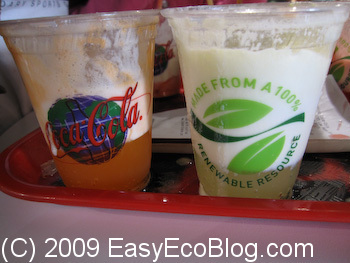 They are using 100% compostable cups in their beverage showroom. 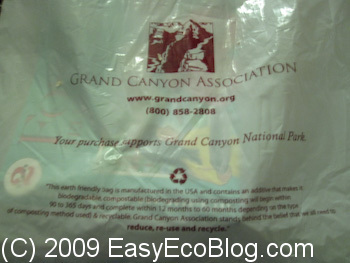 The stores in the Grand Canyon are also using ‘Green’ bags. Did not really want this bag but figured we’d take a picture of one. The clerks were shocked that we did not want a bag. Alameda County Residents: StopWaste.org has $129 Smith & Hawken Biostack compost bins for only $44 plus Sales Tax $4.29 + Shipping $19. San Mateo County Residents: Recycleworks has discounts on Biostack and Wriggly Wranch compost bins for residents. Seattle Residents: Seattle Public Utilities has discounts too. If you are handy, build your own composting bin. It comes with a manual on how to do composting. I like composting because it helps reduce all the trash we throw away. Compost is like super soil that helps produce some awesome plants. Check with your local recycling program provider to see if they have similar programs. Costco and Amazon have sales on composters from time to time. If you live in a city, consider an electronic composter. NatureMill makes the new NatureMill Automatic composter that takes the pain out of composting. Composting takes kitchen scrapes and yard waste and turns them into super fertilizer, helping to divert waste from the trash pile. This product is ideal for apartments and non-gardeners. Traditionally, you take your scraps to a compost box outside and mix them with grass, leaves, and other yard waste. You need to balance green items and brown items and wait several months for results. CNBC’s Trash Inc: The Secret Life of Garbage helped remind us that garbage is everyone’s problem and needs us to be more responsible. Earth-Baby.com is a new service that composts disposable baby diapers and wipes. Finally a green solution to a long time problem. They say their high temperature composting process uses only a tiny fraction of the energy required to launder diapers. The down sides. Their monthly service fee is $29.99 and includes delivery, pickup, and professional processing. You need to use their diapers as they need to control their waste stream. (And profits) Diapers are $11.79 per pack (22-44 diapers depending upon the size) and wipes are $3.59 per pack of 70. Their service is available in the San Francisco Bay Area. Check your local area for similar diaper composting services. gDiapers makes hybrid diapers whose biodegradable gRefills can be home composted, flushed, or thrown away. Knowaste recycles diapers, nappies, adult incontinence and feminine hygiene products (AHPS). Slightly over 2% of trash is diapers, so construction debris, food scraps, and other items are far more important to address.